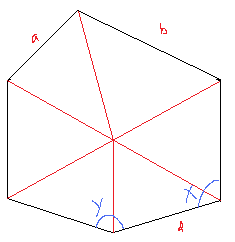 We’ll try the case of a six-sided polygon and will show that if we provide 3 angles, 3 sides and 5 spokes, we can expect someone to figure out the size of the three unknown angles and the lengths of the three unknown sides. 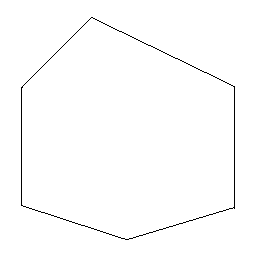 As you can see, this is an irregular shape – it’s not a regular hexagon where the sides and angles are of the same size. You can calculate the unknown angle (we can call it “F”) because we know that all the angles need to add up to 360° (F = 360 – A – B – C – D – E). Since we know the length of two sides and one angle of each triangle that is formed (i.e. side-angle-side, or SAS for short), one can calculate the unknown side of each triangle using the Law of Cosines. Are you familiar with the Law of cosines and how it applies to an SAS case? You can find a lot of explanations online, but we can help you with this if you’re not able to find anything that you find easy to understand. 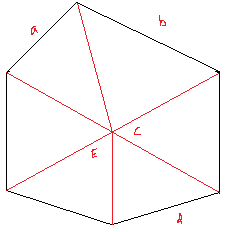 As you can see from the above diagram, if we provide three angles (X, Y and Z) and three sides (a, b and c) and 5 spokes of an irregular hexagon, we can expect someone to figure out the size of the unknown angles and the lengths of the unknown sides. There are many ways to tackle this type of problem . we’ve shown another example below. 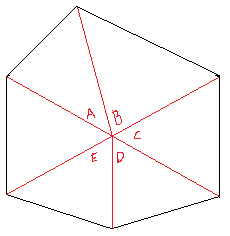 As you can see, we have indicated the lengths of three out of the six sides, and three out of the six angles (the diagram is not drawn to scale). 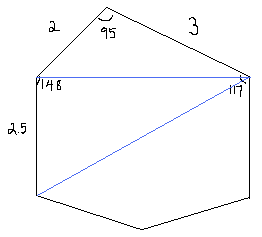 We can find the length of the blue line opposite the 95° angle by recognizing that we know the length of two sides and the angle between them (side-angle-side, or SAS for short). To find using the unknown side, we =an use cosine rule a² = b² + c² – 2bc cos(A), where A is the angle that we know (in this case 95°). a² = 9 + 4 – 12 cos(95°) = 13 – 12*(-0.087155) =13+ 1.0458689 = 14. 0458689, so a = 3.75. 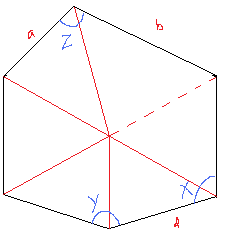 We can now figure out the angle B using the fact that =² = a² + c² – 2ac cos(B): 9= 14. 0458689 + 4 – 2*3.75*2*cos(B). Using a lookup table or a scientific calculator we can see that B = 52.39. 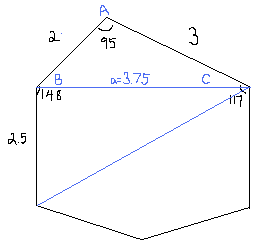 Since we know that the angles of a triangle add up to 180°, we know A+B+C=180°. We know that A = 95 and B = 52.39, so C must equal =2.61. Now that we know that shape and size of the triangle, we can calculate its area. The area equals half the base times the height. The base is 3.75 and we can calculate the height by taking the sin of B and multiplying it by c =height =sin(0.6031)*2 = 0.792183*2 = 1.5844). 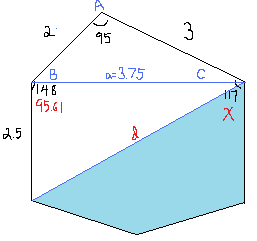 Therefore the area of this triangle (with angles A, B and C) is 0.5*3.75*1.5844 = 2.9709. 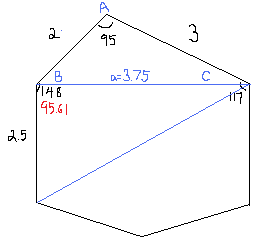 We know that the angle between these two sides is equal to 95.61, since B = 52.39 and the sum of the two angles equals 148. So now we have a similar problem, where we know the length of two sides and the size of the angle that they form (side-angle-side, or SAS). We can solve this just like we solved the problem above. 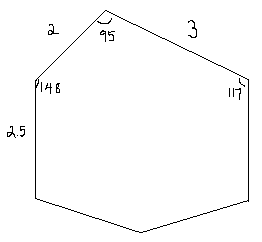 There are too many unknowns to solve this, so we’ll need to provide a little more information so that someone can find length of the remaining sides and the size of the remaining angles. As you can see from the above, we have created four new triangles, three of which are right angles. 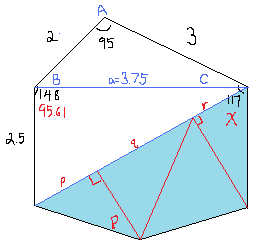 If we know p, q and r and the angle P, we can calculate the size and shape of each of the four triangles.